Summer holidays and weekends offer a chance to kick back and relax with friends and family. Unfortunately, that often means indulging and overeating. Keep in mind that you are not the only one concerned about your weight. I promise people will appreciate it if you provide a variety of healthy and delicious options when you’re hosting a picnic or a BBQ. If you are trying to manage your weight, summer BBQs don’t have to set you back. Keep in mind these hints for a healthy 4th of July BBQ and employ the same hints throughout the rest of your summer. Focus your efforts on fresh and grilled veggies and serve a big, fresh spinach salad topped with sliced red onions, dried cranberries, toasted pine nuts, crumbled goat cheese and a balsamic vinaigrette . Avoid fattening options like potato salad and coleslaw. You can do better! 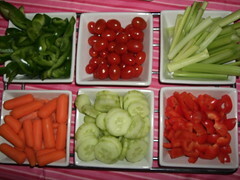 Have a big platter of raw vegetables, called crudites, sitting out for people to munch on while hanging out and socializing. This sort of finger food is easy to eat while lounging in your yard, at a park or at the beach. If you feel a dip is in order, choose hummus! In addition to alcoholic beverages, serve a fruit infused water option. If water with citrus slices is available, people will be more likely to indulge in this zero calorie refreshing drink. For alcohol, serve light beer and wine spritzers to minimize the calories. For the entree, think about a big fish fillet. Salmon is usually a crowd pleaser. Even kids like salmon! You can find affordable, large and fresh fillets at Costco. Plan on 1/3 to 1/2 pound of fish per adult. Slather your fish with your favorite BBQ sauce (or a rub) and slap it on a hot grill, cooking for a total of 10 minutes per inch thickness. Flip about half way through. Take the salmon off the grill when its still a bit pink/raw in the center. Avoid overcooking. Dessert doesn’t have to be super high in calories to be delicious. We’re going to make homemade whole wheat crepes in the morning and stack them up with a piece of waxed paper in between each crepe. We’ll have a bowl of mixed berries without any sugar. We’ll also have some fresh sliced peaches and a bowl of toasted nuts (be sure to check for guest allergies!). Everyone gets to assemble their own crepe. Indulge with a container of light whipped creme to spray on top. The kids will go nuts at the crepe table! Thanks for listening . I wish you and yours a happy and healthy summer!